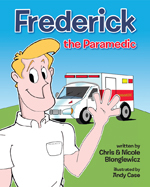 Have your child partner up with Frederick the Paramedic as he responds to the Skateboard Park to help a hurt skateboarder! Together they will check out their ambulance, respond to the emergency, assess and treat their patient, and transport him to the hospital! Your Junior Paramedic will learn about safety awareness, teamwork, first aid, and what happens in a real life emergency–all while engaged in an exciting story with dynamic illustrations!